Quite how old The Crown Hotel actually might be is difficult to ascertain, although it is generally held that the existing building developed from a 17th century coaching inn known as the Kings Arms Inn. Furthermore, the English Heritage text relating to its Grade II status makes note of the date "1896" on a tablet and suggests that the property is in "Shaw Domestic Revival style" which correlates with the late 19th century. Whatever the truth (most likely a remodelling of the original building during the late Victorian period), it was here that the great poet Alfred Lord Tennyson came on several occasions during his life. In a letter to his wife dated September 1855, he recounts finding his way back to the Crown following a walk in the New Forest and describes it as "... true old wild English nature - and then the fresh heath-sweetened air is so delicious. The forest is grand." It seems that Tennyson returned to Lyndhurst in September 1859, and again in June 1861, the latter being recorded in correspondence to both his wife and the Duchess of Argyll. Other notable figures thought to have stayed at The Crown include the scientific polymath Sir Francis Galton in 1909. 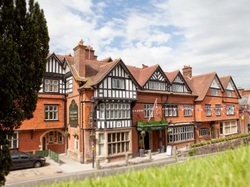 Today the hotel offers 50 guest bedrooms (including a number suitable for families) and is 4 star rated. And, as Tennyson would testify, it is an ideal base from which to discover the delights of the New Forest National Park.